This will probably literally make left-wing religious bigots’ heads explode. 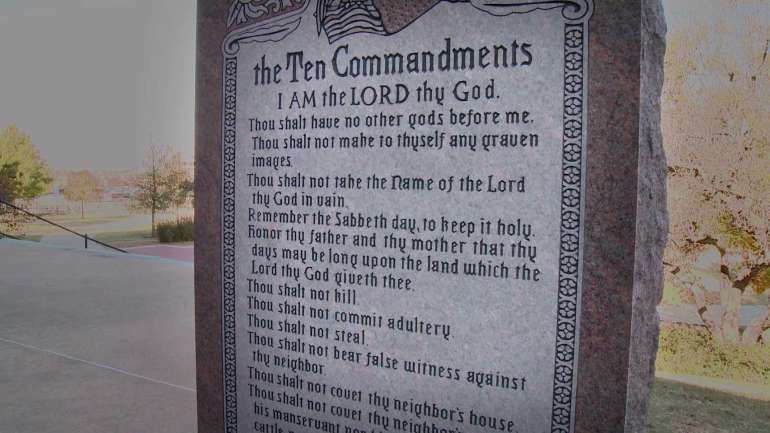 Workers have installed a Ten Commandments monument outside Arkansas’ Capitol, two years after lawmakers approved a measure permitting the statue on state grounds. The 6-foot-tall (1.8-meter-tall) monument was placed on the Capitol grounds early Tuesday. Opponents of the monument have said it amounts to an unconstitutional endorsement of religion and have threatened to sue. Efforts to install that display, however, were blocked by a law enacted this year requiring legislative approval before the commission could consider a monument proposal. Apparently, there was a similar lawsuit against the Texas Capitol having the exact same type of monument years ago. The Supreme Court ruled in favor of the Texas Capitol in that case, so freedom of speech lives on. It’s always interesting to see the outrage of atheists, who claim they don’t believe in God yet do anything and everything possible to wipe out monuments and tributes to the entity they don’t believe in. And they use the 1st Amendment as their reasoning every time, as if they are being forced to look at a monument.